"Reaching, he took the package from my lap and tore away the wrapping, revealing a wide silver band, decorated in the HIghland interlace style, a small and delicate Jabobean thistle bloom carved in the center of each link." 20+ years ago, Diana Gabaldon's first book, Outlander, hit the stores. I must confess, I've been hooked ever since. My poor 20+ year old hardcover has pages ready to fall out from constant reading. This is a love story that doesn't even know the bounds of time. So far, there are eight novels to the saga with another one in the works. The Starzz movie channel has produced a miniseries adaptation of the story, with Season Two beginning in a few months. This is a replica of the ring design approved by Diana Gabaldon in the mid 1990's after "Outlander" was published. NOT the ugly ring fashioned by Murtaugh (?) and others on the Starzz series. As you know, that ring is a tv adaptation. 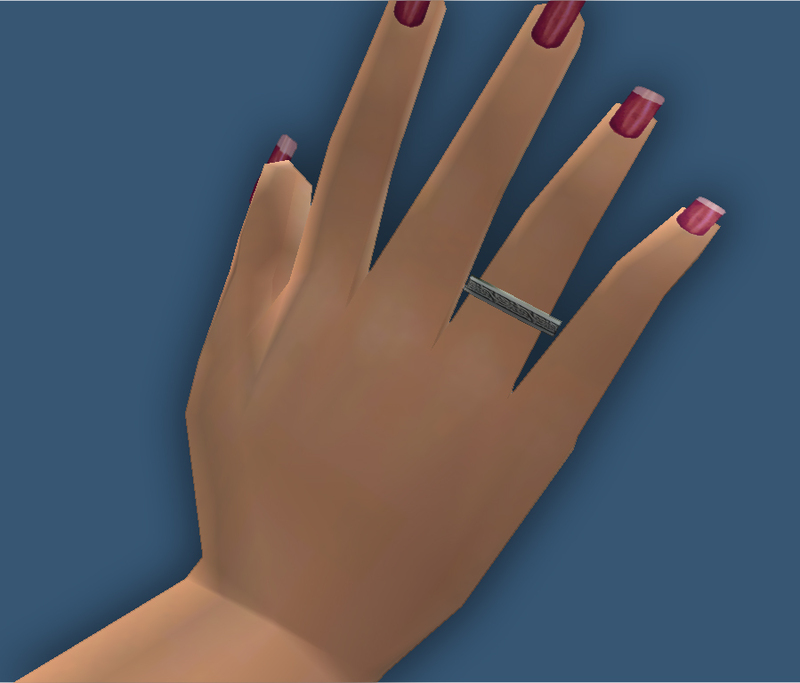 This ring is a recolor of Aikea Guinea's Lower Right Ring Finger Stackable Ring. Why the right hand you may ask if you are unfamiliar with this Claire's saga? Claire was thrown through time while wandering amongst the standing stones at Craigh na Dun from the 1940's to the mid 1740's. She was married to Frank Randall in her "modern" time and wore his gold band on her left ring finger. 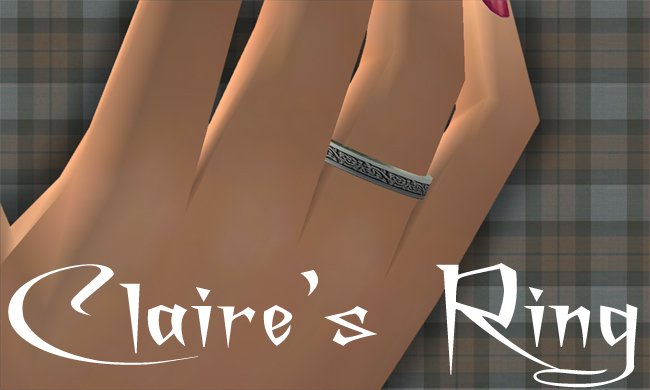 After receiving a wedding ring from Jamie Fraser, she wore Jamie's ring on her right ring finger. Yes, she wears both rings throughout the series. If you haven't discovered the Outlander series by Diana Gabaldon, yet, I highly encourage you to hit up your local library, book store, online library, or even amazon (you can get used copies super cheap there) and read them. Claire's saga is categorized as historical fantasy because of the time travelling factor, but it is so much more. It's a love story, it's a very accurate history of life before, during and after the '45, the 1940's right after WWII, and the early 1970's. 1. Club Crimsyn Repository at GoS. 2. Aikea Guinea at TSR. 3. Almighty Hat's Medieval recolors. 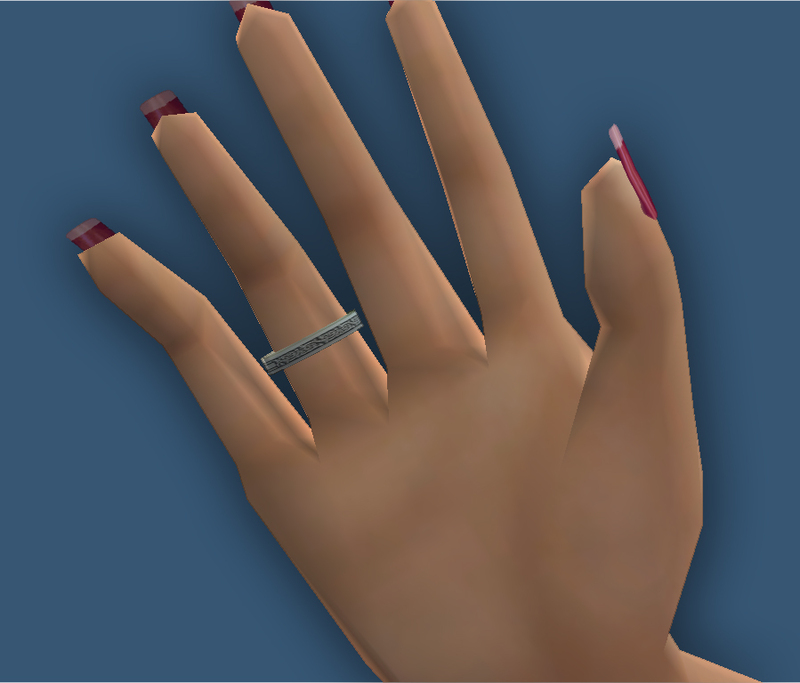 I used the mesh from these sets to make my ring recolor. Michelle (?) Moore for the ring design. I have two names -- Michelle from when I found the texture years ago, and I.V. on present-day images. Thanks to the makers of simPE, Maxis for the game and Bodyshop, the mod team at MTS. Made with Bodyshop, simPE, photoshop7. 67 people have said thanks to Deatherella for this download.